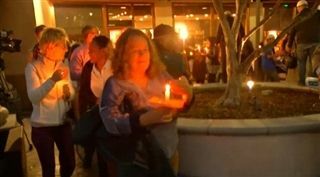 On Tuesday, December 8th, students, teachers and administrators joined members of the Jewish Collaborative of San Diego, the North County Islamic Foundation and Christ Presbyterian Church of Carlsbad at a candlelight vigil for the victims of the December 2nd shootings in San Bernardino. Participants joined together, across faiths, to condemn violence in the name of religion. Please click here to see video news coverage of the event.